Japan’s latest Godzilla entry is a reboot much like Gareth Edwards' near great 2014 blockbuster. While that film evoked Spielberg creature features like Jaws and Jurassic Park, Hideaki Anno and Shinji Higuchi's interpretation is in line with Japan's original vision of an all-powerful god-like monster. Toho Studios have answered the call of the west with "actualllllly, this is Godzilla" and they've put the "God" back in Godzilla. 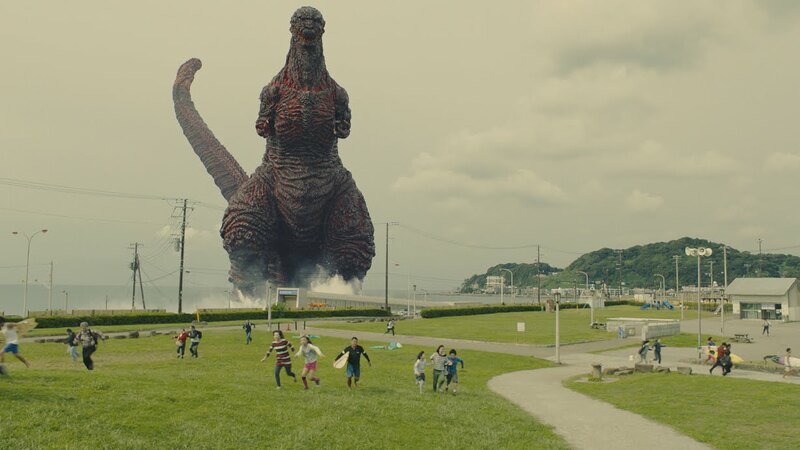 Shin Godzilla, which translates to “True Godzilla,” has the style, scale, and creature effects that recall the best films in Toho Studios kaiju collection. In this re-imagining it is the first time that Godzilla has appeared, making it an updated version of the original Gojira. Where that film made the kaiju a metaphor for the atomic bomb, this film modernizes the metaphor to being a lizard mutated from the 2011 Fukushima nuclear disaster. When steam appears off the ocean, the government shrugs it off as a natural occurrence. As the creature, initially a frog like organism, comes to shore, the government finds itself in a panic while civilians post pictures of the creature on social media. Then like this summer's Pokémon Go craze turned horrific, the creature begins to evolve and all chaos breaks loose. Surprisingly, this film is more concerned with political discourse than it is the giant lizard causing mayhem. Anno's screenplay is a lightly satirical look at Japanese government with more laughs in it than you'd expect. It's also a "how to" guide for solving crisis's that in the end praises systems of government. With loads of speaking roles taking place in offices, board rooms, and hallways, mankind becomes ants digging through files and running through infrastructures. Individuals are swallowed up in the hives of soldiers, citizens, scientists, and politicians. Decisions have to be sent up the political ladder to the Prime Minister, and opportunities to stop the creature slip away. It becomes apparent that the biggest obstacle is the older generation's refusal to adapt. The task falls on the shoulders of the younger politicians and biologists who embrace more innovative solutions. You could single out the leads of this movie as Rando Yaguchi (Hiroki Hasegawa), a Cabinet Secretary, and Kayoko Patterson (Satomi Ishihara), a Special Envoy to the President of the United States. Kayoko is Japanese-American and the symbolic bridge between the two countries whose fractured relationship has to be overcome through negotiation. The resulting "big picture" is a maze of bureaucracy and how the key to successfully navigating these channels is communication. Not just talking to each other but intelligent discourse. In the current political climate that feels, uhhhh, profound. These dialogue centric scenes chew on ideas and spit them out in Sorkinese. It's an odd approach that stunts the pace more often than you'd like in a film with an atomic breathing sea monster, but the rhythm of it eventually creates an idiosyncratic frequency that has never been in a Godzilla film. And just when you may forget that you're watching a Godzilla film, he magnificently appears. The CGI creature effects are occasionally shoddy but the motion capture still maintains the classic “man in a suit” sensibility. The Pokémon like evolutions into his iconic design are a nice touch. Here he's as unstoppable as he's ever been; an entity more than a monster. Initially his presence recalls the 2011 Tohoku earthquake, and just like that causing the Fukushima meltdown, Godzilla grows into a more ominous being and Japan's nuclear past becomes the film's subtext and text. Toho has awakened their greatest creation and for fans it's a long overdue, but welcome homecoming. The human drama is involving enough, occasionally silly, and chews on more than you'd expect. There are updated metaphorical echoes of nuclear and natural disasters, classic Godzilla music, and a fetishistic obsession with military equipment. Godzilla is as awesome as you'd expect in his brief appearances, but the political subtext and satire roars even more than the monster, himself. The political divergences may alienate some viewers, but those divergences are what make it one of the most interesting and weird Godzilla films ever made and a strong starting point that promises greatness.